Advantage Partners Lawyers specialise in providing quality and commercially focused legal advice, strategy and solutions. Advantage Partners Lawyers focus on understanding you, your business, people, culture, goals and visions so as to assist you achieve of your own and your business goals via personalised, practical and commercial strategies and solutions. Our services provide advice and strategies for a wide variety of corporate and commercial areas faced by businesses. 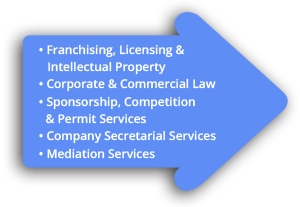 A particular focus of Advantage Partners Lawyers is on franchising, licensing, intellectual property, trade marks, sales/purchases, sponsorships and competitions.